We introduce a real-time motion control system that uses the EtherCAT protocol and apply it to a manipulator with six degrees of freedom. The complexity of a multi-joint manipulator leads to higher requirements for synchronous and real-time performance. EtherCAT technology can greatly improve the performance in terms of accuracy, speed, capability, and band width in industrial control, which is crucial in our robot projects. In this paper, we discuss a servo motion control system based on EtherCAT using IgH as the open-source master station. A Linux operating system is adopted because of the advantages of open-source, high-efficiency, and high-stability operation as well as multi-platform support, which provide more flexibility, freedom, and extendability to developers. Considerable research has been conducted to explore EtherCAT technologies, completely implementing home-made codes with the aid of open-source libraries, debugging the master-slave communication process, and testing the resulting motion controller running on Linux or POSIX-compatible operating systems. To improve the real-time response of servo control, a real-time Xenomai kernel has been compiled, adopted, and tested, and it showed significant enhancement of the real time of a servo motion control system. Furthermore, we explore trajectory planning and inverse kinematic solutions. A trajectory planning method based on B-spline interpolation of three degrees, which makes each part of the trajectory planning curve have relative independence and continuity, is proposed for the kinematic trajectory planning problem in Cartesian space. A coordinate system is established using the modified D-H parameters method to obtain the inverse kinematics of the manipulator. The simulation and experimental results show that the calculation speed of inverse solutions is excellent and the motion of the manipulator is continuous and smooth. N. Li, H. Ma, Q. Fei, H. Zhou, S. Li, and S. Chen, “Motion Control of 6-DOF Manipulator Based on EtherCAT,” J. Adv. Comput. Intell. Intell. Inform., Vol.22, No.4, pp. 415-428, 2018. Q. Liu et al., “Research status and development trends for sensing and control technologies of industrial robot from the viewpoint of patent analysis,” Robot, Vol.38, No.5, pp. 612-620, 2016. W. Wang, “Design of communication system for industrial robot controller based on EtherCAT,” Master’s thesis, Southeast University, 2015. Z. Liu and F. Xu, “Industrial robot network based on field bus,” Information and Control, Vol.21, No.3, pp. 277-279, 2002. 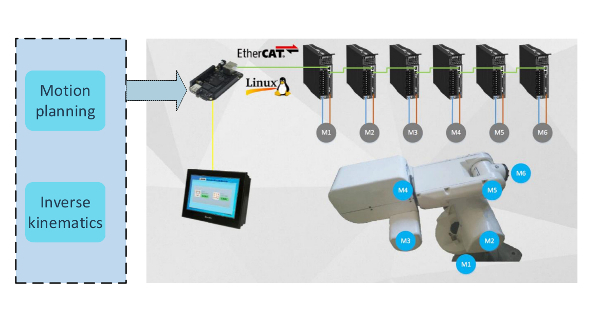 K. Zhou, “Development of EtherCAT master station for embedded platform,” Master’s thesis, Huazhong University of Science and Technology, 2015. H. Cao, “Research on communication technology of industrial robots based on EtherCAT,” Master’s thesis, Southwest University of Science and Technology, 2013. Q. Ruan, “Research on high performance servo control system based on EtherCAT network,” Master’s thesis, Hunan University, 2011. X. Xie, “EtherCAT network and its servo motion control system research,” Master’s thesis, Dalian University of Technology, 2008. C. Shan, Y. Liu, and J. Huan, “Design of industrial Ethernet field bus EtherCAT and driver,” Manufacturing Automation, Vol.29, No.11, pp. 79-82, 2007 (in Chinese). J. Qi and L. Wang, “Networked motion control system design based on EtherCAT,” 2nd Int. Conf. on Intelligent Computation Technology and Automation, 2009. W. You et al., “Control system design for heavy duty industrial robot,” Industrial Robot: An Int. J, Vol.39, No.4, pp. 365-380, 2012. I.-K. Jung and S. Lim, “An ethercat based control system for human-robot cooperation,” Proc. of 2011 16th Int. Conf. on Methods & Models in Automation & Robotics, pp. 341-344, 2011. K. Gu and Q. Cao, “Control system design of 6-dofs serial manipulator based on real-time ethernet,” Proc. of 2014 IEEE Int. Conf. on Information and Automation, pp. 118-120, 2014. D. Liu, H. Min, and J. Yang, “Research of robot control bus scheme based on ethercat,” Computer Engineering and Design, Vol.34, No.4, pp. 1238-1243, 2013. M. Sung et al., “An EtherCAT-based motor drive for high precision motion systems,” 9th IEEE Int. Conf. on Industrial Informatics (INDIN), 2011. M. Cereia, I. C. Bertolotti, and S. Scanzio, “Performance of a real-time EtherCAT master under linux,” IEEE Trans. on Industrial Informatics, Vol.7, No.4, pp. 679-687, 2011. J. Chaichawananit and S. Saiyod, “Solving inverse kinematics problem of robot arm with adjustable snap-width a-star algorithm,” Proc. of 13th Int. Conf. on Electrical Engineering/Electronics, Computer, Telecommunications and Information Technology, 2016. L. M. Capisani, T. Facchinetti, and A. Ferrara, “Real-time networked control of an industrial robot manipulator via discrete-time second-order sliding modes,” Int. J. of Control, Vol.83, No.8, pp. 1595-1611, 2010. H. Zhou et al., “Sampled adaptive control for multi-joint robotic manipulator with force uncertainties,” Proc. of 9th Int. Conf. on Intelligent Robotics and Applications, Vol.9834, pp. 14-25, 2016. Y.-C. Chen, “Solving robot trajectory planning problems with uniform cubic b-splines,” Optimal Control Applications & Methods, Vol.12, No.4, pp. 247-262, 1991. M. Rostan, J. Stubbs, and D. Dzilno, “Ethercat enabled advanced control architecture,” 2010 IEEE/SEMI Conf. on Advanced Semiconductor Manufacturing, 2010. S. Sun, “Multi axis motion controller based on EtherCAT research,” Master’s thesis, Harbin Institute of Technology, 2014. M. Cereia and S. Scanzio, “A user space EtherCAT master architecture for hard real-time control systems,” 17th IEEE Int. Conf. on Emerging Technologies and Factory Automation (ETFA), 2012. W. Chen, “Research on EtherCAT motion control system based on Linux platform,” Master’s thesis, Institutes of Technology of South China, 2012. C. Ma, C. Kang, and X. Huang, “Research on the ethercat master under linux,” Manufacturing Automation, Vol.33, No.4, pp. 78-82, 2011 (in Chinese).